At least, that's what Nellie McClung was told in 1914. As I prepare to make my mark at the polls today, I'm reminding my fellow Canadian women of Nellie and women's suffrage. Although, at times it feels pointless to vote, this wasn't always our right. So I encourage you all to vote for whichever party you choose. 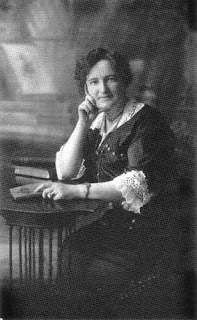 Here's the link to the Historica Minutes short for Nellie McClung. So I went. It was quick and painless. I saw 2 young women voting while I was there, one for the first time. Great for them! And as Neil Young was singing on the way there,"Keep on rocking in the free world." Y'all are ahead of us on everything - Thanksgiving, election day. Love that clip! Go Nellie. I'm off to vote at our cafeteria for a students vote event, then I'll stop on my way home from work. Can you even imagine being a woman and NOT being able to vote? Thanks to the suffragettes, we have women voters and a wide range of women candidates, and we are a better world for it! Women have voices and choices! Just like men. But few people know ALL of the suffering that our suffragettes had to go through, and what life was REALLY like for women. Now you can subscribe FREE to an exciting e-mail series that goes behind the scenes in the lives of eight of the world's most famous women to reveal the shocking and sometimes heartbreaking truth of HOW women won the vote in America and England. Thrilling, dramatic, sequential short story e-mail episodes have readers from all over the world raving about the original historical series, "The Privilege of Voting." Read this FREE e-mail series on your coffeebreaks and fall in love with these amazing women! I agree...it does feel pointless at times...but it is important! We all feel like... why are we even bothering...but we do have the right and we should take it, otherwise things will never change! Bermunda- I quick too. We only knew we were having an election a couple of months ago. We like to get 'er done. Thanks goodness for Nellie and women's suffrage! I also voted. It was like a ghost town at my riding though. I was the only one there to vote at the time. It's a shame that more people weren't doing their duty as citizens. I also got my ballot in for the US election. Being a dual citizen has it's "perks". Go Obama!